Looking at the above chart, I can’t help but muse that weak or technocratic governments can’t get much spending done, but strong governments can. Italy currently has a populist government that intends to provide an economic stimulus. Keep in mind Italy is in its 66th government since 1946 (also note EU elections are coming up next year, with the coalition partners in Italy competing against one another on the EU stage). As can be seen, Italian debt had rallied up to a few days ago when the market expectations of a deficit below 2% for next year dwindled as concessions to the coalition partners lead to an announcement that next year’s deficit will be 2.4% (note: this is still a draft budget; and it’s also a target deficit, the actual deficit may well be different). To be more specific, Italy has started to matter since the financial crisis. As a point of reference, the U.S. federal government estimates its budget deficit to be 4.2% of GDP in fiscal 2018. The possibly most significant difference between the U.S. and Italy is that the U.S. has its own currency. As such, the risk of U.S. government defaulting on its debt is minimal as it could always print its own currency; this creates a risk that the dollar’s purchasing power may erode, but minimizes default risk. In contrast, Italy is part of the euro and, as a result, has waived its right to print its own money. In relinquishing authority to print money, Eurozone countries like Italy can be thought of more like states in the U.S., such as California. The key difference, however, is, that the U.S. government has broad fiscal powers, whereas there is not even an EU Treasury Secretary. The 2018 EU budget is €160 billion, a rounding error compared to the U.S. federal budget of over US$ 4 trillion. All of this is by design as countries, such as Germany, don’t want to cede fiscal control to Brussels, afraid deficits would balloon. Ironically, a lot of the populist movement sweeping developed countries is about taking control back to the national level. As such, Italy should conceptually embrace that the EU doesn’t have its own Treasury. What Italy has a problem with is that Brussels is reviewing Italy’s budget in an attempt to tell it what to do. That’s because the Eurozone has agreements on deficits, notably to keep annual deficits below 3%; and, for highly indebted countries, to actively pursue measures to reduce their debt to GDP levels. And while 2.4% deficits may not sound like much, when the economy grows slowly, total debt-to-GDP will increase even with a deficit of “only” 2.4%. This makes the Italian budget a political battle: firebrand politicians versus bureaucrats. 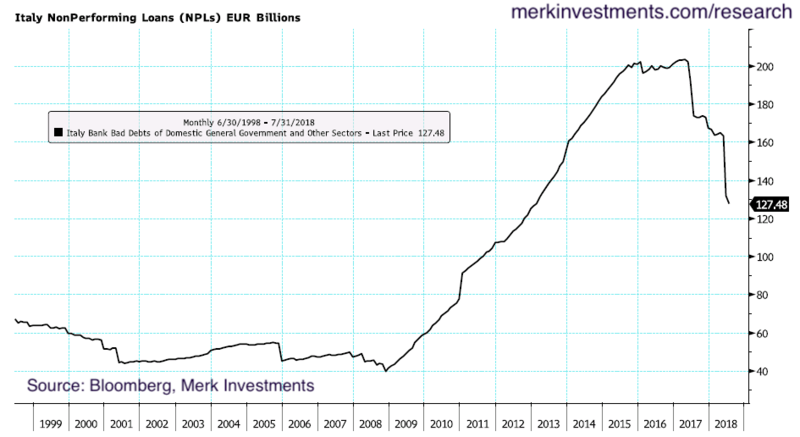 Some Italian politicians have also indicated deficits wouldn’t matter if the European Central Bank (ECB) explicitly guaranteed Italian debt, purchased it in unlimited amounts. EU bureaucrats won’t be able to stop Italian politicians from pursuing their agenda. I mention in my introduction that markets function best when market forces are allowed to play out. In the context of the above statement there’s a simple solution. Mr. Draghi should rescind his July 2012 statement that he would do “whatever it takes.” You cannot have your cake and eat it. Long before the financial crisis, when Wim Duisenberg was still the head of the ECB (he’s the predecessor to Trichet, who in turn was Draghi’s predecessor), I argued that the way to make the Euro sustainable in the long-term would be for it to embrace, rather than fight, differences in fiscal discipline in the Eurozone. Let the policy makers do what they want to do and be held accountable, but not by Brussels bureaucrats: let policy makers be held accountable by the markets. If we look back at the financial crisis, arguably the most powerful incentive for reform has been the market. Since the financial crisis, several rescue programs have been created, although it had also become clear that governments prefer to pursue extreme measures before asking for help when the cost of the help is to give up sovereign fiscal control. In this model, countries pursue their own fiscal policy; if they need help, they give up sovereign control. In that context, let me mention that I don’t endorse some of the chaos in the markets at the peak of the financial crisis. But be aware that crises will always happen; they are, however, less stressful when sound institutional processes are in place. I have long argued that much of the work of European regulators should be focused on making the system more robust to failure. In the U.S., we have bank failures all the time, yet there’s no crisis because there is a robust process in place (the FDIC steps in). Similarly, especially in recent years, many steps have been undertaken to make the Eurozone more robust. In my assessment, that work needs to continue with the goal for the Eurozone to be able to stomach a sovereign default within the Eurozone. The ECB is expected to phase out its quantitative easing (“QE”). 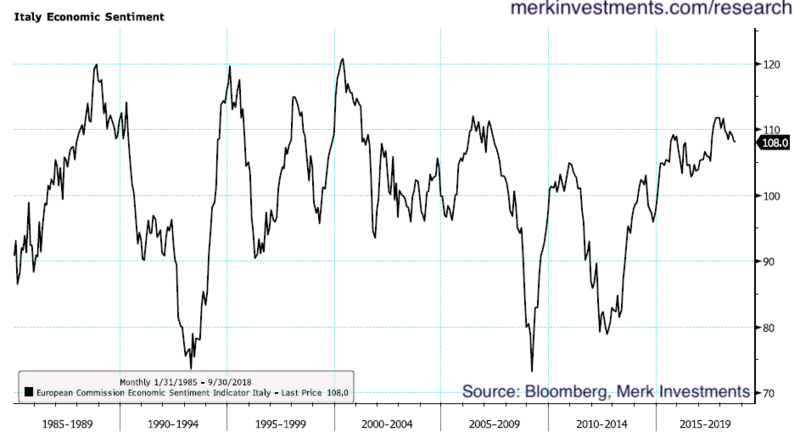 A first interest rate hike in quite some time may well come before Draghi retires. When Draghi retires, my best guess is a less dogmatic ECB chief will take charge. Consider that a lawyer became head of the Fed. The pendulum is swinging away from activist central bank chiefs. Inflationary pressures are gradually increasing in the Eurozone. 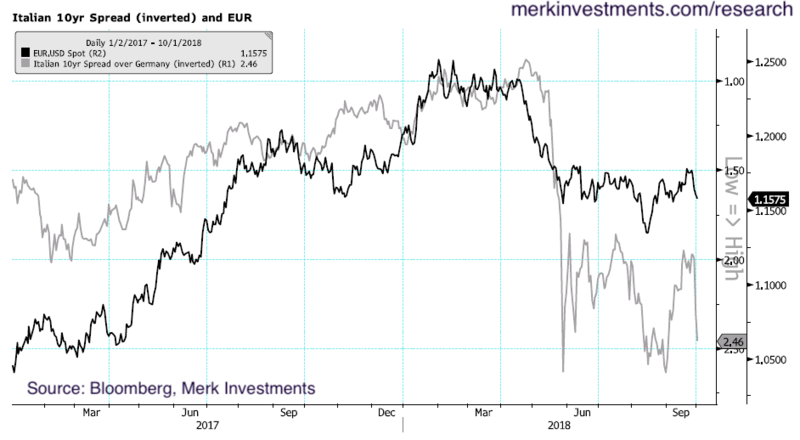 Note the ECB’s inflation target is on headline inflation, not core inflation (Duisenberg and Trichet respected that; Draghi has all but ignored this despite his claim he pursues his QE policies to achieve the ECB’s legislated mandate). 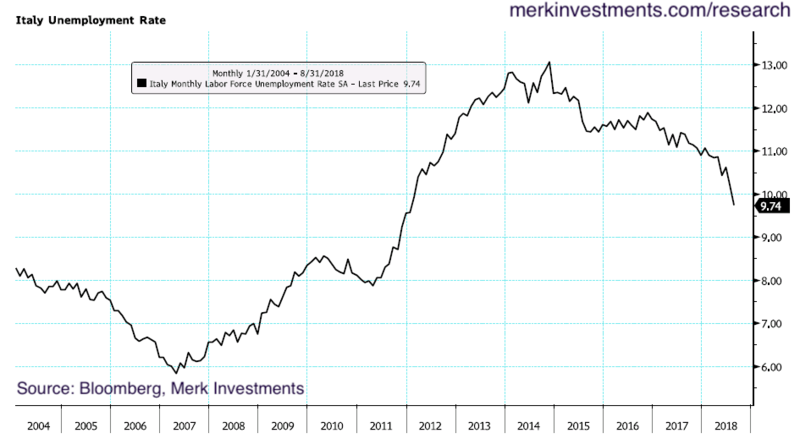 Draghi has indicated US fiscal stimulus may cause an inflationary spillover to the Eurozone; and that EU fiscal policy is also expansionary (more so if Italy implements its proposed budget!). 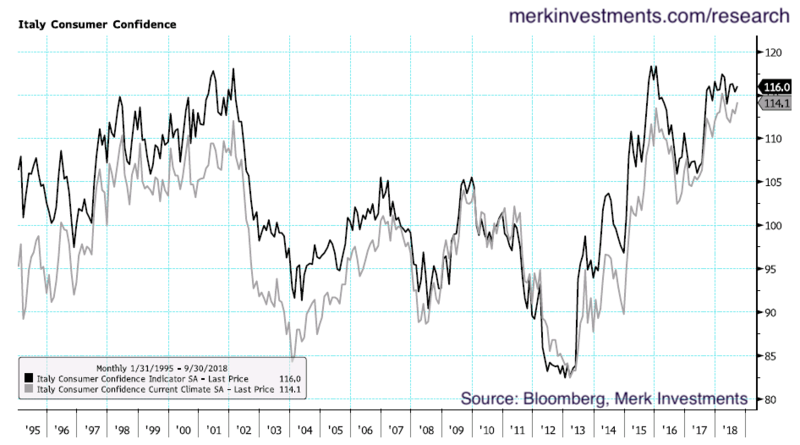 I mention the above because, in my assessment, they point to higher rates in the eurozone, as well as higher spreads. 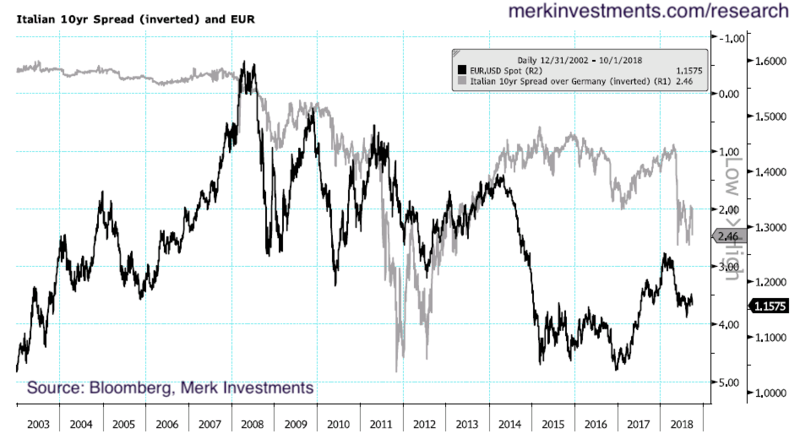 Higher spreads because, in our analysis, the main achievement of quantitative easing throughout the world has been a reduction of risk premia, i.e. a tightening of spreads, making risky assets appear less risky. As QE goes into reverse, risk premia ought to rise, causing spreads to increase. 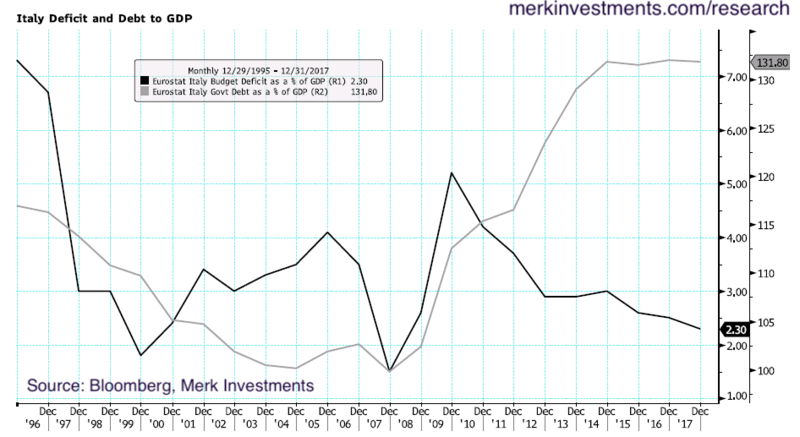 In plain English, Italy should get used to paying more for its debt. Policy makers and market participants alike should stop the illusion that Italy will some day pursue German fiscal policy. It will not be the end of the world, nor the end of the Eurozone because risk friendly capital will gladly hold Italian debt – at the right price. The problem with a risk-free illusion is that you coerce risk-averse capital to hold risky securities. That’s a problem because the moment a reality check kicks in, risk-averse capital jumps ship. Aligning expectations with reality fosters healthy markets; artificial barriers create fragile markets bound to break under pressure. As I indicated, we are moving in this direction as risk premia are bound to rise and regulators will continue to work to strengthen financial institutions. In this context, I argue the flareups we see in the markets will, with hindsight, be considered noise. 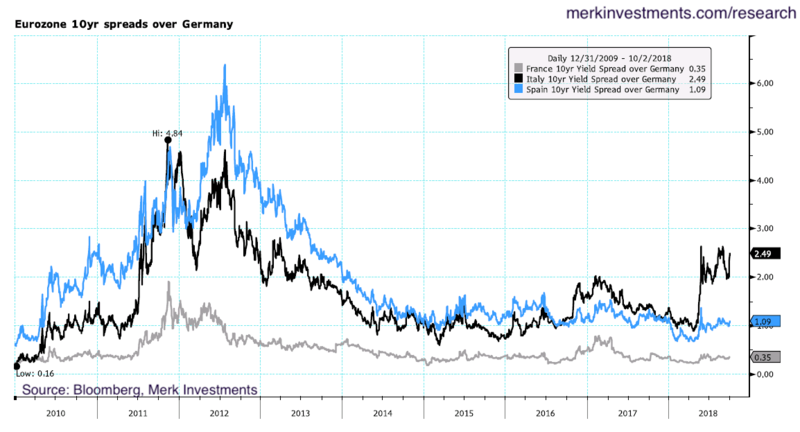 I’m not suggesting there won’t be turmoil, but those who seek the relative safety of German bunds will pursue those; others interested in the higher yield may purchase Italian debt. What is unhealthy is to chase yield and live under the illusion that the additional yield is risk free. The argument against this tough-love argument is that it could break countries, give rise to extreme parties. I would counter that in arguing that QE has been a key reason why populist governments have gained influence as one of its many unintended consequences. Printing money does not solve problems, only shifts the burden. At the peak of the financial crisis, I argued the best short-term policy may be a good long-term policy. I stand by that: stability is a result of a predictable, sound institutional framework. When the rules are clear, it ultimately benefits all stakeholders. And when mistakes have been made, someone has to pay for it. That includes governments that have spent too much money. The Eurozone isn’t structured to offload one’s debt problems to a central bank magic wand.